Good Thursday morning from New Orleans, where I'm moderating a panel tonight on "The Future of Cities" at the U.S. Conference of Mayors' summer leadership meeting. 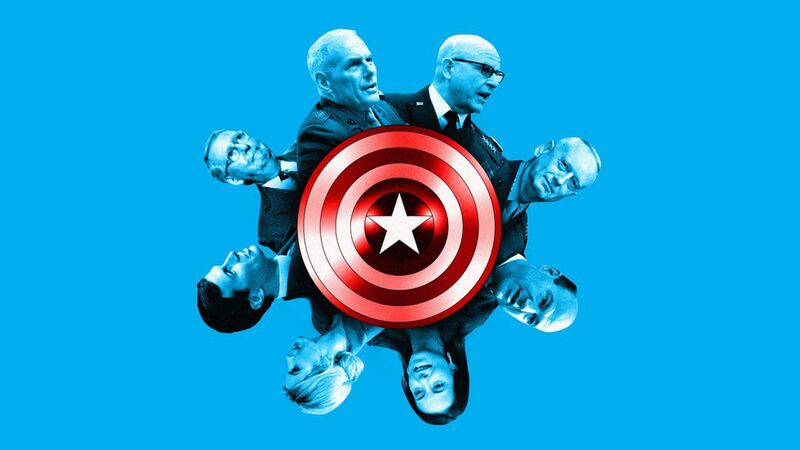 Here's one of the most intriguing — and consequential — theories circulating inside the White House: The generals, the New Yorkers and Republican congressional leaders see themselves as an unofficial committee to protect Trump and the nation from disaster. This loose alliance is informal. But as one top official told me: "If you see a guy about to stab someone with a knife, you don't need to huddle to decide to grab the knife." The generals — White House Chief of Staff John Kelly, National Security Adviser H.R. McMaster and Defense Secretary Jim Mattis — speak frequently, see the world similarly and privately express a sense of duty to help steer Trump. The chairman of the Joint Chiefs of Staff, Gen. Joseph Dunford, is an ally. The New Yorkers, including economic adviser Gary Cohn and Deputy National Security Adviser Dina Powell (with 25 years of foreign-policy experience for conservative House members and President George W. Bush), have subsumed some of their personal views to blunt Trump's worst ideas. This crowd is highly skilled at communicating with the president (using visuals and grand positioning) to refine or moderate "America first" provocations. Treasury Secretary Steve Mnuchin is also very involved, helping demand a process where POTUS has all the information to make domestic and international economic decisions. Republican congressional leaders won't win any profiles in courage for standing up to Trump. But almost all could move against the president if special counsel Bob Mueller finds crimes, or the president succumbs to radical instincts. They view their main function as getting real facts to the president, and injecting their belief in the importance of alliances and military relationships around the world. As an example, if Trump had plunged ahead with his thirst for a trade war, the U.S. might not have won China's backing in the U.N. vote last weekend for sanctions against North Korea. These officials pick their battles, knowing that Trump is going to go ahead with some decisions — like renouncing the Paris climate agreement — no matter what. And much of what they do is silent. AP reported that Mattis and Kelly, when he was still Secretary of Homeland Security, "agreed in the earliest weeks of Trump's presidency that one of them should remain in the United States at all times to keep tabs on the orders rapidly emerging from the White House." These officials think Trump deserves a functioning staff, West Wing and process. They say they believe in him, but want the processes in place to give him accurate information and the right options. Outside critics contend that these aides are rationalizing their role as enablers. Be smart: One of the biggest dangers to Trump's reign is that if Mueller acts or public support plummets, he suddenly could be lonely in his own White House. "[D]uring a conference call beforehand that focused on North Korea, Mr. Trump did not offer a preview of what he planned to say — and aides did not press the president, who resists being told what to say." "Trump has embraced the new, more disciplined approach of the former Marine general [who's now his chief of staff, John Kelly], but he has made it clear that he will not cede control of what he says or tweets." "Tuesday's statement proved that he cannot be muzzled by his staff or decorous diplomatic protocol." 3. An ominous turn: "probable cause"
Squeeze the former Trump campaign chairman to cooperate against others. Send a message to others that they better cooperate if they want to avoid humiliation. As John Heilemann told Lawrence O'Donnell on MSNBC: "What Robert Mueller is doing right now is turning up the crank ... There are two guys who could be the prime people who could flip on Donald Trump, on the Trump family: Paul Manafort and Michael Flynn." "We are now moving into the next phase, which is: 'We see what the case is. We're now gonna try to go in and lock this case down.' And they're moving faster than I think anybody thought." "Using a search warrant, agents appeared [July 26,] the day Manafort was scheduled to testify before the Senate Judiciary Committee and a day after he met voluntarily with Senate Intelligence Committee staff members." "The search warrant requested documents related to tax, banking and other matters. People familiar with the search said agents departed the Manafort residence with a trove of material, including binders prepared ahead of Manafort's congressional testimony." "Manafort's allies fear that Mueller hopes to build a case against Manafort unrelated to the 2016 campaign, in hopes that he would provide information against others in Trump's inner circle in exchange for lessening his legal exposure." A cyclist passes the setting moon as she rides across the Key Bridge toward Georgetown early yesterday. Matt Drudge — who has kept his look steady even as everything else in media has convulsed — made a striking change Monday, beginning with a "NUKE YOU" banner headline: His photos, usually colorful amid the spare typewriter front, were suddenly black and white. Drudge has recorded 11 billion visits to his site in the past year, and still breaks traffic records after decades as "the nation's assignment editor." He sometimes makes one-day changes to his look and feel for special occasions: blue type on the Fourth of July, or green type on Christmas. But when the noir look persisted this week, I had to ask him what was up. Drudge instantly replied: "We have clearly entered a historic era. It's feeling like The Roaring 20's this autumn with tech valuations at such hysterical heights. The socials, like Instagram Live, are alive with the spirit of Warhol. The sound of the atom splitting is looming over Korea. What's old is new. So, black and white and read all over!" Why it matters: Journalists these days talk constantly about how to capture and reflect the once-in-a-thousand-years events unfolding in front of our faces. Drudge once again was the innovator — with a retro look, and a prescient rationale. Anthony "Mooch" Scaramucci joins George Stephanopoulos live Sunday on "This Week," for his first interview since being booted as White House communications director on July 31, after 11 days. Mooch will then appear Monday on Stephen Colbert's "The Late Show." 7. "He’s doing it 100% for service"
The president pays close attention to TIME magazine covers, and the forthcoming issue trumpets new White House Chief of Staff John Kelly as "TRUMP'S LAST BEST HOPE." "In moments of crisis, American political leaders have often turned to the nation's military brass to guide the country with clear thinking. For the time being, current and former officers are positioned to perform double duty, providing for the common defense abroad and a measure of common sense at home." "Trump, who defers to virtually no one, shows a clear preference for, and deference to, the military brass. ... Rarely in U.S. history has a clutch of senior brass played such an outsized role in the affairs of state." A close aide: "Right now, [Trump is] very happy to have someone taking control. I think there will eventually be an adjustment period when he feels like things are working and some others that he wants to revert back." "Trump gets bored with people easily and has a history of blaming aides for his own missteps. Even Kelly may not be immune." "In the second quarter, households saved 3.8% of their disposable income, down from an average of about 5% last year and 6% in 2015, according to revised figures released by the Bureau of Economic Analysis last week." Why it matters: "In 2007, before the recession began, Americans were socking away about 3% of their after-tax income. But during and after the downturn, cautious consumers sharply scaled back their borrowing and saved more." "U.S. worker productivity picked up modestly in the second quarter but showed little sign of breaking out of the sluggish trend that has prevailed for more than a decade, holding back economic growth and living standards." "New York is on the verge of completing the world's most complex underground map ... It will improve public safety, help officials better manage rapid growth, and [help foster] the era of 'smart' cities." "Because of data from satellites, we can now map the world down to about 6 inches. ... But the world beneath our feet remains shrouded in darkness. 'Light and radio waves don't go through dirt like they do air.'" "Underneath [New York's] 6,000 miles of asphalt and concrete road lie thousands of miles of water, sewer, gas, telecommunications, and electrical infrastructure. And let's not forget the 500 miles of underground subway tracks or Con Edison's 100-mile steam delivery system." "In its entirety, it's known to no one. The individual details of the vast underground are hoarded and guarded." Twitter users posted dozens of images of the irate-looking fowl with a golden pompadour, seemingly glaring down at the White House from the Ellipse. The chicken appeared in the background of live TV shots. The balloon appeared in April before a protest to pressure Trump to release his tax returns, and has its own Twitter account, @TaxMarchChicken. Everything else about the chicken is mysterious.